This April’s battle re-enactment in Minute Man National Historical Park, which took place only two days before the Marathon bombing, in hindsight seems as peaceful as an ordinary footrace. All the musket shots were blanks, and participants were prevented by Park Service rules from depicting death or injury. 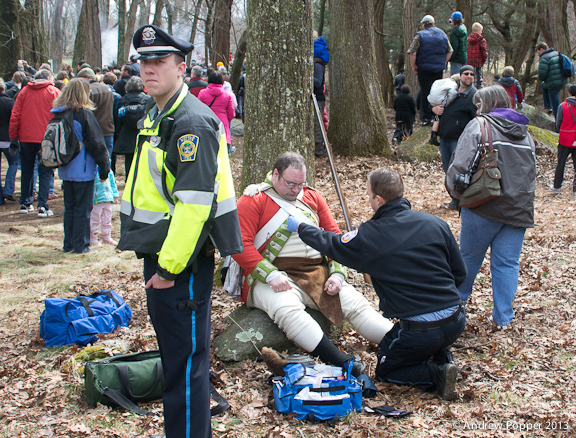 “Wounded by diabetes,” a Redcoat straggler was attended by police and local medics. 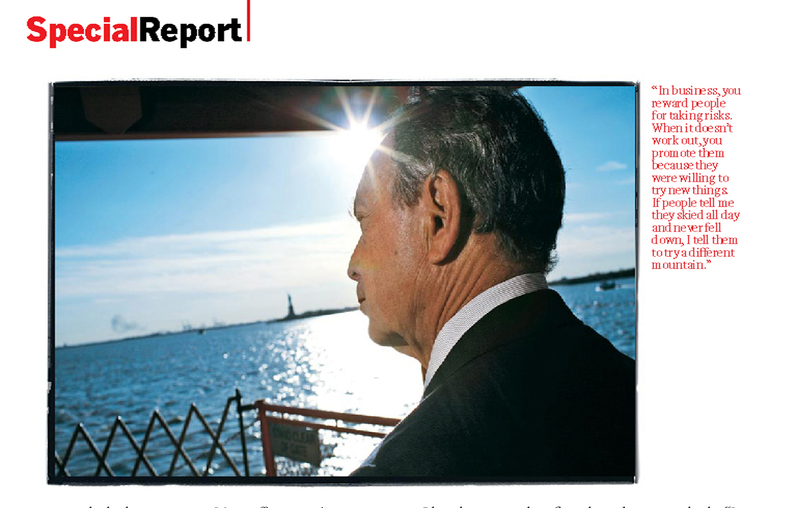 The recent passing of Ed Koch brought to mind this 2007 story I picture-edited in Business Week. 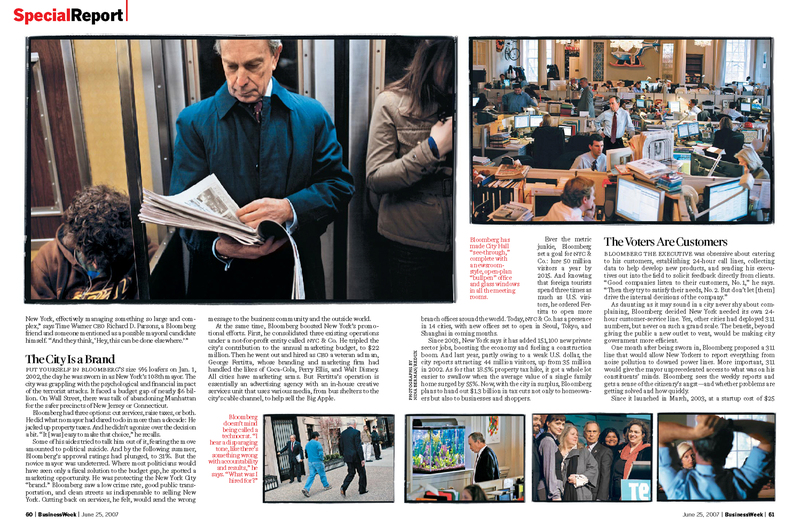 Mr. Bloomberg later bought the magazine, but that, perhaps, is a different story. 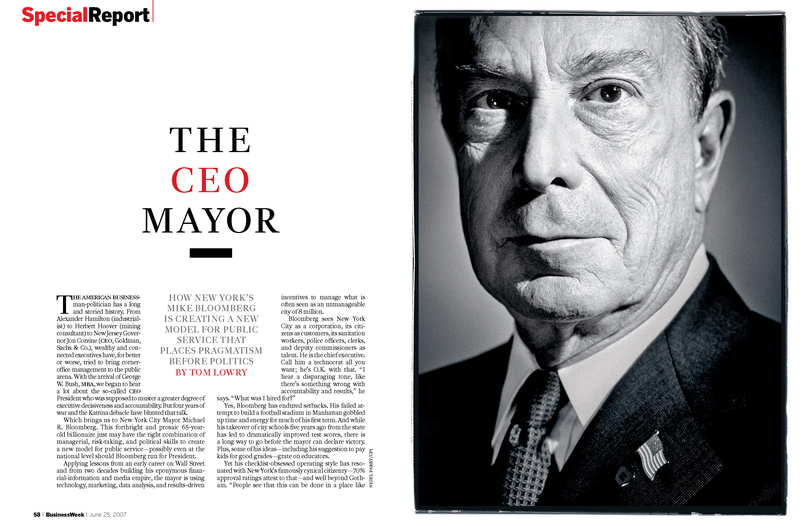 Nigel Parry’s City Hall portrait nailed the intended cover language, though the story ran on inside pages, downplaying Bloomberg’s rumored presidential aspirations. Unanswered question: who killed the cover? I negotiated with the Mayor’s handlers for photojournalist Nina Berman to have what turned out to be a Koch-esque whirlwind around the boroughs, though this boss is quite a bit more buttoned-down than his ostentatious predecessor. Berman’s quiet but persistent approach paid off as our final frame paired smartly with a quote gathered by writer Tom Lowry. The picture and words (see below) combine to portray the Mayor as a thoughtful but demanding technocrat. 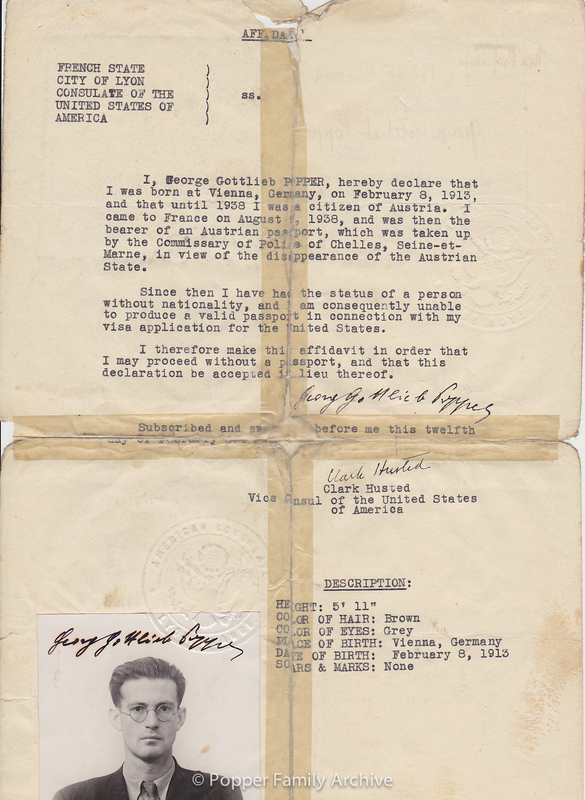 My father, George Popper, was born 100 years ago this week: Feb. 8, 1913. He came from Vienna, but fled to Paris when the Nazis annexed Austria. His parents remained there in hiding for the duration. His brother Felix narrowly escaped Kristallnacht, and lived later in England, Canada and New Hampshire. The third brother, Rudi, was imprisoned in 1938, and died in Buchenwald in 1942. George escaped through the south of France in 1941, and lived in New York until his death in 1991. While scanning some of my father’s document from the refugee years, I was intrigued by somewhat remote, but perhaps not trivial parallels with Hollywood’s Casablanca . . .
Feb., 1939. 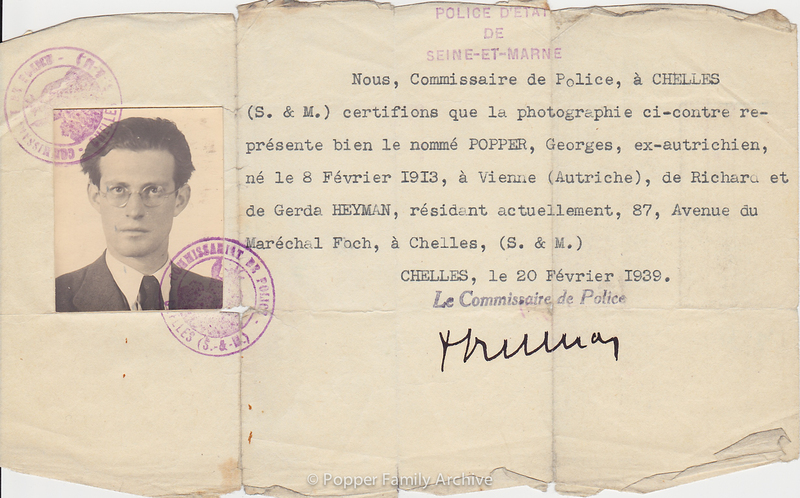 Residency document issued by Commissioner of Police in the Paris suburb of Chelles: George Popper, ex-Austrian, age 26 resides at 87, Avenue du Marechal Foch. 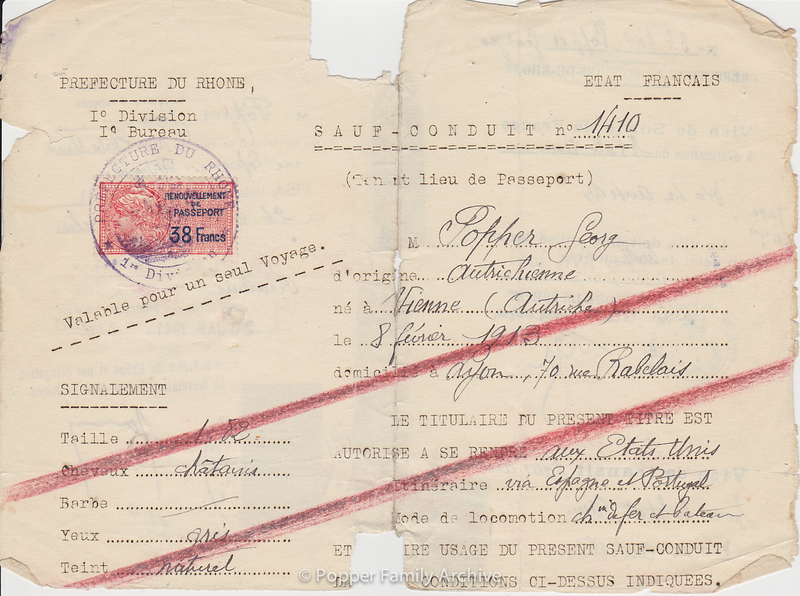 Upon turning in his Austrian passport to the French gendarmes, my father was without papers except for the driver’s license (below) he had earned as a 20-year-old law student in 1933. The “Z” markings merely showed that he wasn’t qualified to drive trucks or operate steam engines. 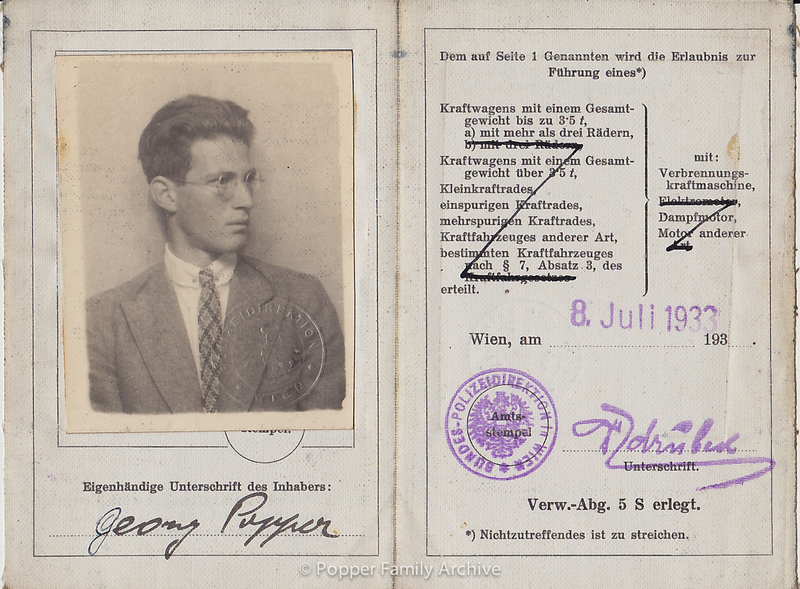 July, 1933: George (then Georg) Popper’s motor vehicle license. Always resourceful at finding work, my father gained admission to a cheese-making school in the South, paying his way by manual labor. But in September, 1939, he was imprisoned along with many other stateless persons and “enemy” nationals. Hoping perhaps to appease the Nazis, France segregated its prisoners by religion. Though a Jewish agnostic, my father declared Christian as his best chance for survival. He was made a prestataire — an unarmed conscript — and assigned to a work detachment at an artillery base, under armed guard. Letting his beard grow out was the only available means of protest. 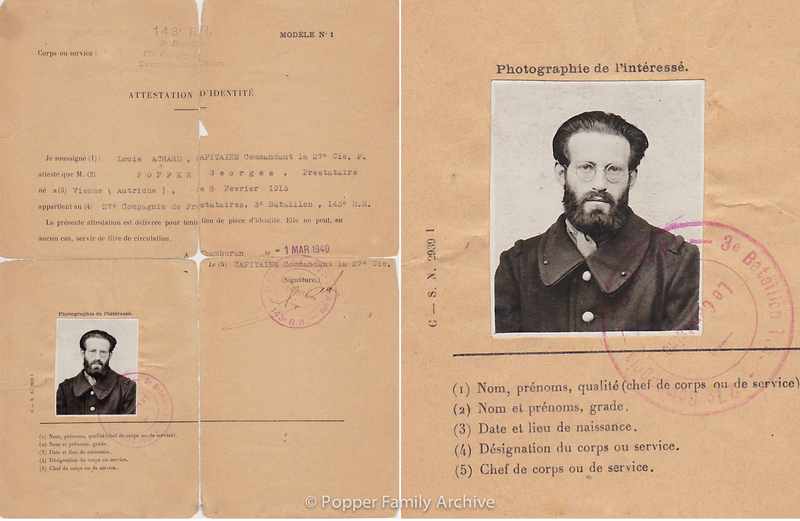 George (now Georges) Popper’s ID document in French artillery camp. May, 1940: The fall of France, to Germany’s invasion in the North, led to anarchy in the South. Refugees fled from the camp and frantically searched for escape routes, while Gestapo agents were watching everywhere. George was fluent in French, and lucky to have been geared up for a mountain climb when interned a year earlier. So for a time, he worked as a farm hand, pretending, at the farmer’s insistence, to be Swiss. Before that wore out, he made up his mind to risk a train ride to Lyon, where America still maintained a Consulate. Declaration presented to United States Consulate in Lyon. Feb. 1941: Another stroke of luck. The consular official, Clark Husted, listened to his story. Back in Vienna, George had put his name on a waiting list for a U.S. visa. Husted looked at the current list: the name wasn’t there. Then he found an expired list, looked at it, and there it was. Visa granted, simple as that. Still, more travel documents were required . . . Safe conduct pass in lieu of passport, signed on reverse by French functionary — not de Gaulle — good for transit to USA via Spain and Portugal by train or boat. Still no ticket, no money, and then a bout of dysentery. Friends already searching found him near death in a refugee camp, helped him revive and again find work. At last he and a fellow ex-internee, Josef Franckenstein (OK, different movie), booked passage on the French-flagged tramp steamer Winnipeg. Jam-packed with others fleeing France, the ship set sail for the West Indies via Oran and Casablanca . . .
Wartime formula postcard intended for use by French soldiers, to convey brief messages to their loved ones. Yet war pursued the Winnipeg. Somewhere short of Martinique, as my seasick-prone father lay sleeping above decks, she was captured by the British with a shot across the bow. Undaunted, and after one more brief internment, he made his way to San Juan, Puerto Rico and onward to New York. He arrived in the heat of summer, to news that Germany had invaded Russia: a sure sign, he would always say, of Hitler’s impending doom. 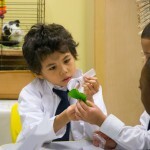 Neighborhood Charter School in Harlem, NYC, needed a fundraising and recruitment tool. I made this slide-and-audio promotion piece in December. Thanks to radio reporter Jon Kalish for help with audio editing.